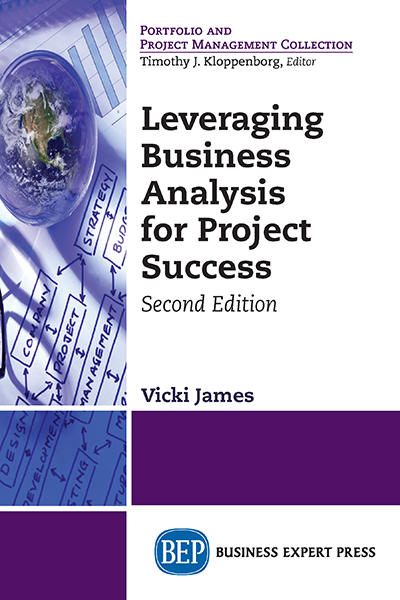 Vicki James (PMP, CBAP, PMI-PBA) is a business consultant with expertise in project management and business analysis. She is passionate about learning and sharing best practices in these two fields of endeavor. Certified in both project management (Project Management Professional certification from the Project Management Institute since 2005) and business analysis (Certified Business Analysis Professional from the International Institute of Business Analysis since 2010) she is professionally trained to offer and capable of providing a broad view to support project governance and processes. Vicki spent 11-years in the public sector successfully delivering projects to support governmental operations. Today she provides private consulting to government and private industry clients in addition to writing and presenting on all aspects of projects. Vicki has co-authored Strategies for Project Sponsorship (Management Concepts 2013), contributed to The Complete Project Manager (Management Concepts 2012) by Randall Englund and Alfonso Bucero, and is a popular blogger and Tweeter.